DOVER, Del. 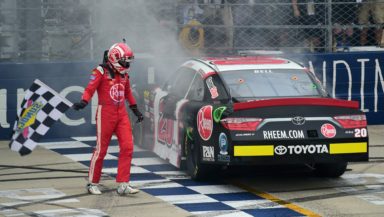 – Rookie Christopher Bell captured another NASCAR Xfinity Series (NXS) victory on Saturday in the Bar Harbor 200 at Dover International Speedway in the elimination Playoffs race. With this win, Bell became the winningest rookie in series history with six victories. “It’s the means the world. To be able to have the season we had, it’s been a career year for me. It’s all credit to everyone at Joe Gibbs Racing and my crew chief Jason Ratcliff. Everyone that works at the shop to put these Camry’s together. We have really fast cars every time we go to the track. All of our partners deserve it.” Bell said. Cole Custer finished second, Justin Allgaier third, Ryan Preece fourth and Spencer Gallagher finished fifth. “Our car was pretty solid. It was a lot about track position and we had to work on our car throughout the day, but the car was awesome at the end. We just needed a tick more.” Custer said. Bell also advances to the Round of 8 along with Custer, Justin Allgaier, Daniel Hemric (7th), Austin Cindric(8th) , Elliott Sadler(11th), Tyler Reddick(14th) and Matt Tifft(15th).